When you’re getting prepared to interview three of the funniest people in Hollywood, you have to come with your A game or just make them laugh. On May 20, Sony Pictures will release its long-awaited film Angry Birds. Yes, those angry birds. The movie stars Jason Sudeikis, Josh Gad and Maya Rudolph. The ever-popular game that had people suffering from carpal tunnel because they couldn’t put their phones down long enough was made by Rovio and catapulted to popularity in 2009. The game only cost a little over $100,000 to make but made over $70 million in its first year and counting. And now with the movie release coming in May, you can be certain that Rovio Animation and the film’s producer, John Cohen, are hoping for a renewed interest. The movie features an all-star cast that includes Gad, Rudolph, Sudeikis, Sean Penn, Danny McBride, Tony Hale, Keegan-Michael Key, Bill Hader and Peter Dinklage, as well as Ike Barinholtz, Tituss Burgess, Hannibal Buress, Jillian Bell, YouTube stars Smosh (Ian Hecox and Anthony Padilla), Billy Eichner and Danielle Brooks. In the movie, Red (Jason Sudeikis) is an angry bird who is forced to attend anger-management classes after his latest angry run-in in the bird paradise. Joining him in anger management are two other birds. Chuck (Gad) has a penchant for speed and embellishing details. And Bomb (McBride) is a bird who suffers from intermittent explosive disorder, or IED, so you don’t want to get him angry or he’ll explode. … literally. Topping off the anger-management class is the person responsible for getting the birds’ anger in check, and that’s Matilda (Rudolph). She’s a sweet little bird, but don’t let her sweetness fool you. So you have Gad, Rudolph and Sudeikis playing the birds many people have come to love through their cellphones. 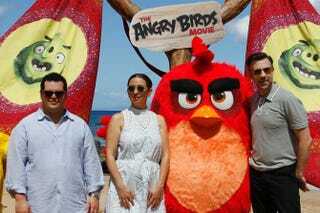 Although they play angry birds, they were anything but angry at a press event held on the island of Maui in Hawaii. I mean, who can be angry when your background is paradise? During an interview with The Root, Gad, Sudeikis and Rudolph shared some interesting stories about what makes them angry. “The political season does make me angry. It’s become so divisive,” Gad said. As a parent to small children, Rudolph had one thing that makes her angry. “Why do they make the things that you have to open on Christmas morning wrapped so ridiculous. ‘Mommy, will you do this?’ is not how I want to spend my Christmas morning,” Rudolph said. Sudeikis also questioned why kids’ toys nowadays need screwdrivers to pull them out of the packaging. But there’s one thing that’s certain: He probably has a well-mannered kid, because bad manners make him angry. “Lack of manners. That has a lot to do with my folks,” Sudeikis said. “Were your folks bad mannered?” Gad asked. When talking to the three actors, you could tell that although they didn’t film the movie together, they easily play off one another’s energy. But how does that work when you’re interacting in a movie, but you’re not even in the same room? “They gave me a Jason Sudeikis pillow to hold,” Rudolph joked. “They give you headshots of the other people,” Gad chimed in. “What did they give you of mine?” he asked Rudolph. “You don’t want to know,” she laughed. Sudeikis said the fact that they’ve all worked together before made it easy for him. Based on how well the cast of the movie joked with one another while enjoying the Maui sunset, one can only imagine what would have happened if they had filmed the movie together. Angry Birds opens May 20.